It’s official. Today is the first day of fall. Just as I was getting sick of summer, here comes autumn to save the day. I absolutely love watching the leaves turn. In fact, those are the trees in our backyard. However, they don’t look like that right now. This picture was from last year. They will look like that next month. I’m not a winter person, so I’m going to absorb as much autumn into my blood streams before the cold really hits. And by cold I mean Georgia’s humid piercing cold. Not the snowy stuff. 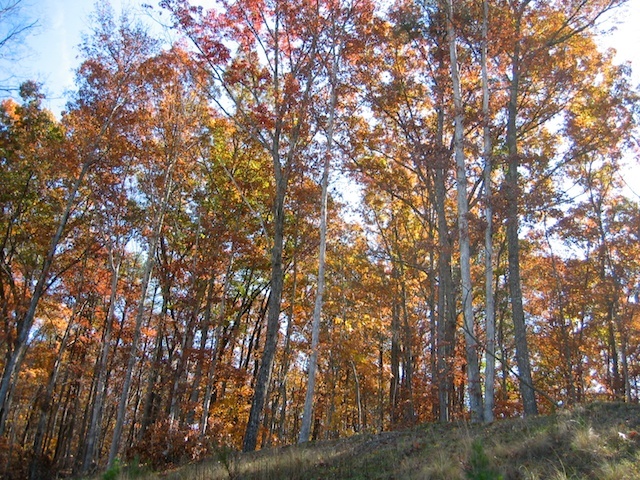 Go on a fall foliage hike. Best time to see the colors. Corn maze. Get lost. Sometimes it can be long winded, so prepare yourself with ways to entertain the little children. Sing songs. Change the air filter in your house. The season is changing which also means it’s time to clean out the air filter. Get rid of all that summer dust and start fresh. Tour colleges with your high school senior. It’s a good idea to check out some potential colleges to get a feel for which ones you are serious about applying to. Visit Go See Campus, a site with all sorts of statistical and admissions information for colleges in the U.S. It also provides you with ways to set up a campus tour. Be a tourist in your own town. So you’ve lived there for 20 years. Have you seen everything in your town? What about that one shop you pass on the way to the library and always wondered about? Or that small local museum? Pick a pumpkin. Get your children involved. They probably won’t pick the one you like or the one that looks good, but they will love being involved in the choosing. We enjoy going to a pumpkin patch. Cook a pumpkin. Use the pumpkin to make pumpkin bread or pie. And don’t forget to roast the pumpkin seeds. Take a mini vacation without the kids. It is not vacation season yet since children are still in school and the holidays aren’t quite here. This means you can find great deals without all the crowd. Even if it’s just staying in a hotel the next town over. Leave the children with a family member or good friend. You won’t regret this time to yourself. Have a yard sale. Declutter and get rid of the stuff you haven’t used in a while. Clear the way for winter as you will be indoors more. Start thinking about Christmas gifts. Oh yes. Don’t do that last minute stuff. If you start now, you will come up with better ideas and find great deals. Then when Christmas rolls around, you can actually enjoy the yuletide. » What are you looking forward to this fall? What is your favorite thing to do this time of the year? I have already planned on taking a trip to the farm to pick pumpkins, do the corn maze, see the animals, and go on a hayride. Also we will go to an apple orchard in a few weeks to pick apples for my first ever apple pie, wish me luck! We are also going to try out Randy’s homemade cider press this year! I am excited as cider is one of my absolute favorites! I love fall! You inspired me to use our pumpkins to bake pumpkin bread & carve them for our date night with friends next week-thanks!